Installing AppFabric 1.1 for Windows Server raise error 1603. 2016-07-10 16:29:54, Information           Setup  Microsoft.ApplicationServer.Setup.Upgrade.V1UpgradeSetupModule : Initiating V1.0 Upgrade module. 2016-07-10 16:29:54, Information           Setup  Microsoft.ApplicationServer.Setup.Upgrade.V1UpgradeSetupModule : V1.0 is not installed. 2016-07-10 16:30:04, Information           Setup  Microsoft.ApplicationServer.Setup.Upgrade.V1UpgradeSetupModule : Initiating V1 Upgrade pre-install. 2016-07-10 16:30:04, Information           Setup  Microsoft.ApplicationServer.Setup.Upgrade.V1UpgradeSetupModule : V1.0 is not installed, not taking backup. 2016-07-10 16:30:04, Information           Setup  Executing C:\Windows\Microsoft.NET\Framework64\v4.0.30319\aspnet_regiis.exe with commandline -iru. 2016-07-10 16:30:04, Information           Setup  Windows features successfully enabled. 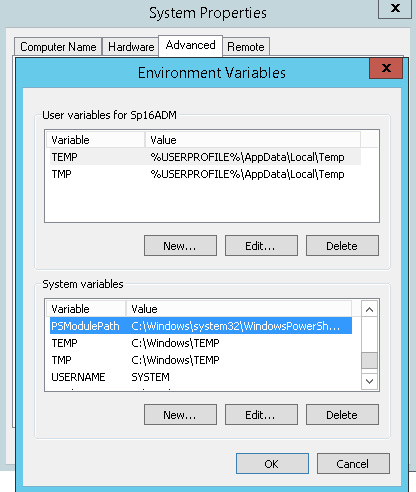 AppFabric attempts to insert a new System variables PSModulePath which may already exist from other installation.